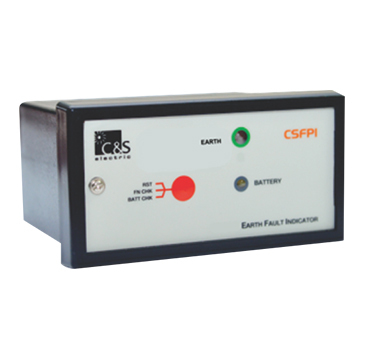 CSFPI, Fault Passage Indicator — Earth is designed to detect and indicate Earth fault on a cable system, in RMU networks with one input / open ring arrangement. The unit will indicate a fault condition when current is detected above set trip current settings. Fault current is sensed by cable mounted sensor, which gives signal to indication unit. Sensor must be mounted on screened cable and can be retrofitted on the cable.If the Earth current exceeds programmed set current for programmed response time the fault will be indicated by red flashing LED and relay contact will be activated. Reset occurs automatically by preset time passage or by a external potential free input or by recovering of 230V AC (Not a Aux. Supply) Voltage or by manually via push button. A ‘Functional Test’ can also be carried out on field by pressing for more than 8 Sec and ‘Battery Test‘ by pressing the Push button for more than 6 Sec. The sensor for earth fault detection is a summation type current sensor and it is dimensioned in such a way that if can be mounted around all three phases of the network. Programmable parameters can be set through DIP switches which are accessible by opening the Front Cover of the CSFPI indication unit. Exit (Disable) option is available for fault detection.